We’d love your help. Let us know what’s wrong with this preview of More Parts by Tedd Arnold. Through zany, brightly colored illustrations and rhyming verse, Arnold explores common figures of speech that amaze and frighten a young boy. "I'll bet that broke your heart," "give him a hand," "Hold your tongue," and "jumps out of his skin" are only a few of the sayings that worry the protagonist. To ask other readers questions about More Parts, please sign up. Two perks for the price of subbing for one 2nd grade class! We actually read this one first (they had already read Parts sometime before). It was almost as cute as the first one, which I opted to reread to them since it was new to me. Comparing the two, I felt that this story was much more farfetched than its predecessor. How is an ordinary five year old kid going to keep his body parts all in place, when people keep saying strange things, like "give me a hand", "hold you tongue", and other sayings that requires the body and its parts. This funny tale brings to visual life in the mind of a five year old the use of figures of speech. The boy is funny. Because when people say to take of from your body he tries to glue himself together and when he goes in his room his parents find him and they say why do you look like this? And the boy says people say to take off parts of your body. I thought this book was a fun way to talk about idioms with children. The main character in this book takes everything very literally and goes crazy about the silly things people say that they don't really mean in a literal sense. This is a super cute book about a little boy who thinks all sorts of idioms like "break my heart" and "crack me up" are literal and he gets scared and tries to find ways to protect himself from this crazy world. We love these books! Poor little anxious guy. A young boy goes through a day in trying to be as safe as he can be. During his day he comes to different adventures that lead him to almost falling apart. Fun and silly read aloud book. Good to read to students to help them realize that some things are said with the intent that that are not to be taken literally- Screaming her lungs out, etc. Good vocabulary and nice illustrations. 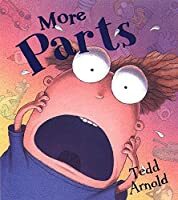 “More Parts” is the sequel to Tedd Arnold’s famous “Parts” book and it continues the story of how the little boy from the previous “Parts” book tries to understand some of the idioms about body parts that everyone around him is saying. This book is just as funny and cute as the first book and it will certainly be a favorite among children for many years. Tedd Arnold’s writing and illustrations are both cute and hilarious as this book details about how a boy worries about his body falling apart a “More Parts” is the sequel to Tedd Arnold’s famous “Parts” book and it continues the story of how the little boy from the previous “Parts” book tries to understand some of the idioms about body parts that everyone around him is saying. This book is just as funny and cute as the first book and it will certainly be a favorite among children for many years. 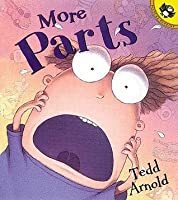 Tedd Arnold’s writing and illustrations are both cute and hilarious as this book details about how a boy worries about his body falling apart after he hears these strange sayings from everyone around him. 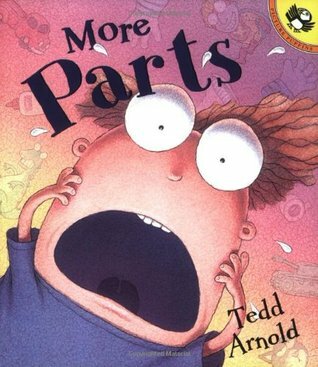 Tedd Arnold introduces the theme of idioms in this book, while in the first book; the boy witnesses the weird stuff happening to his body. The boy actually takes these idioms seriously since he is young and many small children usually go through what this boy has gone through in this book since they do not understand what idioms mean. 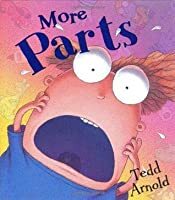 Tedd Arnold’s illustrations are amusing and creative as he illustrates everyone in the story having large eyes and small bodies, which makes this book seem more humorous than scary when dealing with the fears of one’s body falling apart due to the idioms being said in this book. 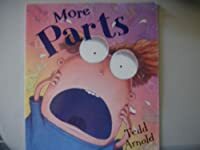 “More Parts” is a great sequel to “Parts” and it greatly defines a child’s fears about falling apart every time they hear an idiom that relates to the body such as, “Hold your tongue” and “I’ll bet that broke your heart.” I would recommend this book to children ages five and up since smaller children might be unsettled by some of the gross images in this book. Personal Reaction: I thought this book was hilarious!! It is so funny to see this little boy frightened of certain phrases such as "He nearly jumped out of his skin," "it broke his heart," and my personal favorite "Give me a hand." This story is hilariously written and the illustrations add to the madness and confusion this little boy is feeling. -enjoyment: the story is very funny, and the students can maybe relate to how the boy feels about some of these idioms. - Personal Reaction: I thought this book was hilarious!! It is so funny to see this little boy frightened of certain phrases such as "He nearly jumped out of his skin," "it broke his heart," and my personal favorite "Give me a hand." This story is hilariously written and the illustrations add to the madness and confusion this little boy is feeling. -the illustrations are literal interpretations of the idioms/figures of speech that are commonly misunderstood. Potential discussion on the phrases and the picture that belongs with it. Asking if they think this is what the author means. The pictures will also keep students entertained as well. -great way to introduce a language arts lesson on figurative language and idioms. Defining them and giving examples. -integrating figurative language into a student's writing. Tedd grew up with three brothers. His family lived on a farm in Pennsylvania for several years then returned to Elmira until Tedd was ten years old. His father's work then required that they move to Gainesville, Florida. There, Tedd's first art lessons in an abandoned dentist's office over the Happy Hour pool hall eventually led to a fine arts degree from the University of Florida. He and his wife, Tedd grew up with three brothers. His family lived on a farm in Pennsylvania for several years then returned to Elmira until Tedd was ten years old. His father's work then required that they move to Gainesville, Florida. There, Tedd's first art lessons in an abandoned dentist's office over the Happy Hour pool hall eventually led to a fine arts degree from the University of Florida. He and his wife, Carol, started their family in Tallahassee where Tedd worked as a commercial illustrator. Carol, a kindergarten teacher, drew Tedd's attention to children's books. Their first son, Walter, inspired his breakthrough picture book, NO JUMPING ON THE BED!.